Wave Life Sciences provided an update on the timing of the release of the topline data from their ongoing PRECISION-HD program. In their letter, Wave noted that they will be in a position to release trial topline results by the end of 2019. 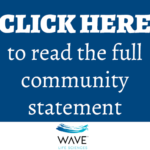 You can read Wave’s full community letter here. Wave Life Sciences has two active Phase 1b/2a Clinical Trials in Canada that are looking at two closely related drugs – WVE-120101 and WVE-120102 – that are designed to stop cells from making the mutant huntingtin protein. Wave’s PRECISION-HD trials are testing drugs that “shoot the messenger” – targeting the messenger RNA (mRNA) that translates the HD gene and leads to the production of the mutant huntingtin protein. Wave drugs target only the mRNA that is associated with the abnormal CAG repeat, leaving the normal part untouched. (People with HD have both because they inherit two versions of the gene: a mutant version from one parent and an unaffected version from the other). We will continue to stay in touch and keep you updated as more information is made available. For our family members, if you have specific questions about participation in clinical trials we recommend that you contact your local neurologist, Movement Disorders or Huntington disease clinic.